Oregon is blessed with an abundance of rivers that offer thrilling rapids that often hide secret prizes and angling adventures. Winter steelhead are silver-sided prizes; anglers often must endure tough outdoor conditions to catch them. Yet, steelhead fishermen love this time of year when winter’s cold and wet conditions rule. Jim Skaar and Josiah Darr agree that if there’s a better time or place to get away from work they couldn’t say where or when. 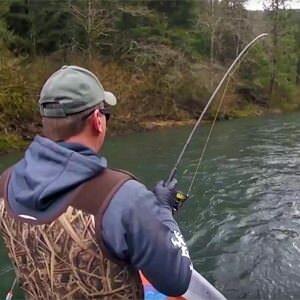 They are volunteer anglers building a fishery future on Oregon’s Wilson River. “Now, this is the kind of day you like to be on the water,” offered Darr. “Sun is playing peek-a-boo but there’s no rain in sight. Wow! 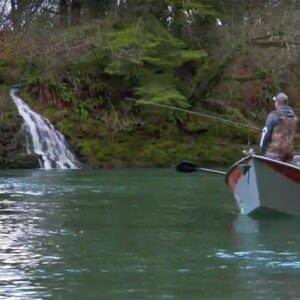 Each angler casts into secret spots where they’ve caught Wilson River winter steelhead before. Both cast bobbers above bright pink beads or yarn flies with fresh steelhead eggs. 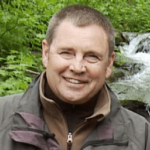 Darr is a local fishing guide and Skaar is the ODFW Trask River Hatchery Manager. Today, they’re two lucky anglers getting away from it all to support an idea that’s hitting its stride: the Wilson River broodstock program. Skaar’s bobber sank without hesitation and he pulled back, thrilled when he saw a chrome steelhead shoot through the surface like a rocket. He had hooked a dandy! The ocean-going rainbow is fresh from the sea and it will tip the scales at 14 pounds. Skaar said that more than 50 volunteer anglers participate in this sport fishery program that began in 1997. The volunteers use hook and line to catch and collect up to 53 pairs of wild adult fish that are kept alive in aerated aluminum boxes. The Trask Hatchery crew will pick up the wild steelhead throughout each week and transport them to the hatchery. The adult fish are live-spawned and then returned to the river so they can continue their lives. Unlike salmon, steelhead will return to the ocean and even return back to their home river again following a year or two in the ocean. The 106 wild steelhead that the volunteer anglers collect will produce 100,000 steelhead smolts that will be planted in the Wilson River next year. It’s a unique program that is in place in several other Oregon rivers like the nearby Nestucca and Alsea Rivers. “Oh, it’s a jumper,” yelled Darr, as Jim set the hook on another silver sided steelhead. The steelhead flew out of the water several times and peeled off line from Skarr’s screeching reel. Following a 10-minute battle of back and forth, Darr smoothly slid his large net under Skarr’s gorgeous steelhead. 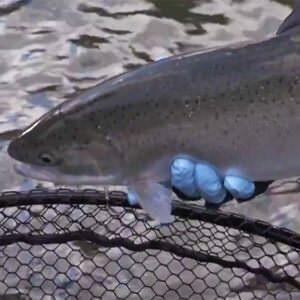 The program provides hatchery steelhead that anglers can keep in a season that begins in December and stretches through April.